World leaders in modern classic yacht design and build, Spirit Yachts has a portfolio of wooden sail and power yachts ranging from day sailors to superyachts. Famed for timeless beauty combined with performance, Spirit Yachts are built using the highest quality, sustainable timber sealed with epoxy. This method of construction, combined with Spirit Yachts’ iconic flush decks and long overhangs, creates fast, lightweight yachts that turn heads wherever they go. Spirit Yachts can be seen competing in classic regattas and cruising in bays all over the world. Whether it’s day sailing, blue water cruising or performance racing, Spirit’s range of sail and power yachts offers ultimate flexibility. Whilst the Spirit has a portfolio of existing designs on file, all yachts customised to suit an owner’s criteria and are designed and built to order. Unlike many yacht builders, Spirit Yachts conducts both the design and build process in-house at its waterside headquarters in Suffolk. With designers and builders in one location, communicating and working collaboratively, Spirit is able to offer customers a seamless journey from the design to the launch of the finished yacht. 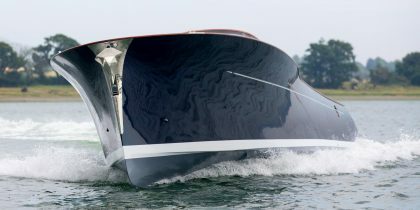 Spirit does not use any moulds; all yachts are built by a team of boat builders dedicated to delivering the the finest craftsmanship. A Spirit Yacht embodies the essence of a modern classic yacht: timeless style incorporated with the latest technology to create a yacht of exceptional quality and performance. 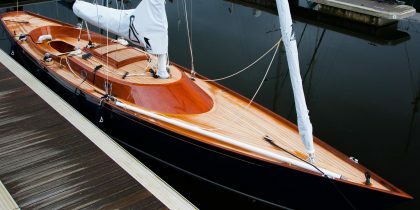 Spirit Yachts has pioneered the design and build of modern classic yachts using wood epoxy construction. Each yacht is built using the finest quality, sustainably-sourced timber by a team of international and highly skilled boat builders with a passion for detail. Whilst each yacht is customised to suit an owner, every sailing yacht design stays true to Spirit’s iconic long overhangs, low freeboards and flush decks. Spirit’s range of motor yachts has the essence of the 1930s-inspired styling of its sailing range, combined with a true planing hull, a flared bow and a tumblehome stern. All Spirits are eligible to race in the Spirit of Tradition class at classic regattas worldwide and many owners compete annually with successful results. 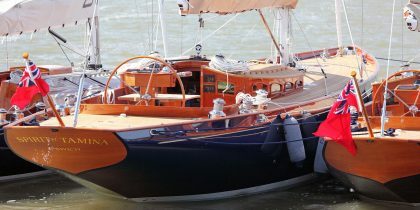 The criteria for the Spirit of Tradition class require yachts to be designed with a classical look and be built using modern techniques and materials. Spirit of Tradition yachts must also demonstrate excellent craftsmanship on deck and in the hull, however they may have modern underbodies and appendages and use the latest technology in their rigs. Stunningly beautiful with high performance; Spirit Classics combine elegant looks with the latest marine technology. Immensely strong, lightweight and easy to handle. Offering the legendary performance of the ‘Classic Spirits’ with the addition of a raised coachroof for increased volume and protection from the elements whilst cruising. All the style, elegance and craftsmanship of Spirit’s modern classic sailing yachts applied to a portfolio of sophisticated motor yachts; from tenders and day boats to superyachts.